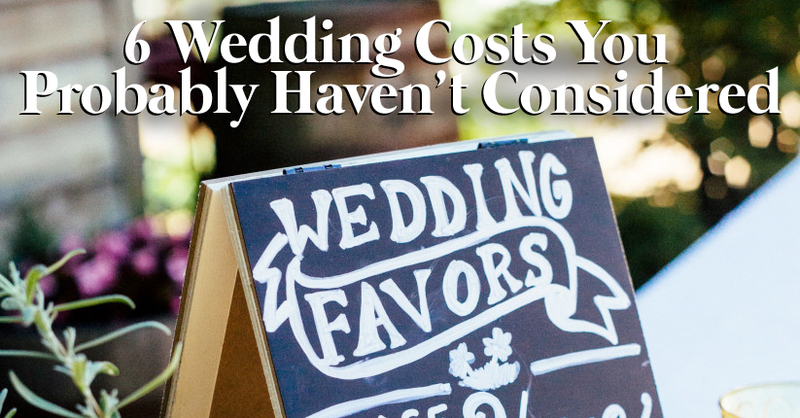 6 Wedding Costs You Probably Haven’t Considered - RiverCrest Weddings - Montgomery County, Chester County & Philadelphia's premier wedding venue. Planning a wedding budget is hard; adhering to one is even harder. While most couples factor in the obvious costs (venue, music, flowers, transportation, food and drink), they often forget about the smaller, unexpected wedding costs that can sneak in and derail even the most thoughtfully planned budgets. While most of these wedding costs are relatively small, especially in comparison to those other big-ticket items, they add up quickly, so you’ll want to carve out room in your budget for them. Here, six hidden wedding costs to keep in mind when putting together your wedding budget. Weigh, weigh, weigh! If your invitation suite is over an ounce, you’ll have to pay more per invitation. And you’ll have to fork over extra postage for square invitations. Some invitations can cost over a dollar per invitation to mail, so be sure to add a line item to your budget breakdown for this. Of course, you’ll spend a chunk of your budget on save-the-dates and invitations, but there are also plenty of paper goods you’ll be using at your ceremony and reception, too. Think: programs, place cards, menu cards, table number cards, and any other signage you may want. And remember to add on your thank-you notes, too. If you think the sticker price on that wedding gown is all you’ll be paying, think again. Most wedding dresses will need to be altered, and this can run you up to a few hundred dollars, depending on whether you need a simple hem job or a far more complicated change, like adding straps or significantly altering the size or structure of the gown. Your wedding-day vendors — like your band or DJ, photographer, and videographer — will need to eat something at your reception. While this meal generally costs less than your guest dinners, you’ll still want to plan on tacking on a few extra meals. This is an unexpected biggie: Most experts recommend that you allocate about five to 10 percent of your overall budget to tips for vendors like your transportation company, photographer, videographer, baker, florist, bartenders and valets. Check out our previous post on who to tip and how much to give here. You’ve most likely planned for wedding favors, but there are other small gift-y goods you might want to include in your wedding budget. From gifts for your parents and wedding party (like engraved flasks for the groomsmen and monogrammed clutches for the bridesmaids) to hotel welcome bags (filled with snacks and any other day-after items guests might need), these tokens of appreciation can add up. Overwhelmed by all of these hidden wedding-day costs? Don’t be. Just plan ahead, ask your vendors plenty of questions to see what’s included in your contract, and check out RiverCrest’s tips for saving money on your wedding here. Happy planning!